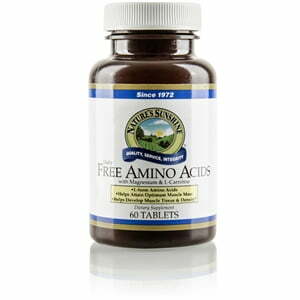 Nature’s Sunshine Free Amino Acids with Magnesium & l-Carnitine is a supplement designed to help those involved with activities that push the limits of the body’s strength and endurance. In order for the body to recover properly, the body requires twenty types of amino acids to make proteins, which aid muscle repair. 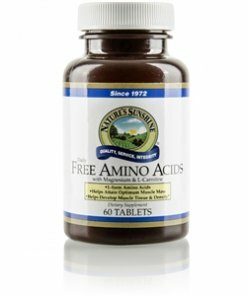 Nature’s Sunshine Free Amino Acids provides the eight essential amino acids that the body doesn’t create and must be obtained through diet. These eight essential amino acids (EAAs) are structured to meet the efficiency of the pattern set by the Food and Agricultural Organization/World Health Organization (FAO/WHO). This supplement also provides l-Carnitine, which helps transport fatty acids for energy, and Magnesium to aid in the metabolization of amino acids. Nature’s Sunshine Free Amino Acids with Magnesium & l-Carnitine is essential to support recovery from any type of workout routine. Instructions: Take two tablets with a meal three times daily in addition to your daily multiple vitamin and mineral supplement. Hydrolyzed whey protein (from milk), cellulose (plant fiber), stearic acid, silicon dioxide (powdered silica), and magnesium stearate (vegetable).